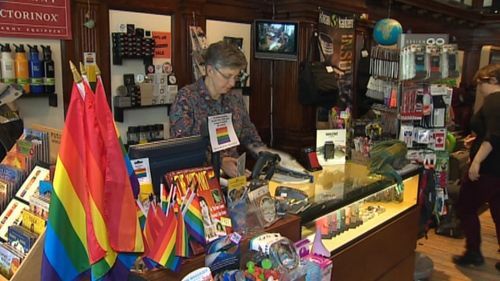 St. John's, the capital of the Newfoundland and Labrador province in Canada, is leading the way in an effort to show support for LGBT Russians and athletes during the Sochi Olympics beginning on Friday. At the behest of Josh Eddy, the publisher of LGBT publication The Outpost, St. John's mayor Dennis O'Keefe and the town council unanimously voted to fly a rainbow pride flag over the city hall. Now Eddy's efforts are catching fire in other towns around the province. "Flying the rainbow flag during the Olympics is really a sign of support for people in other countries, in this case in particular in Russia, the people who have been denied their liberties as individuals, and people who are being persecuted because of their sexual orientation," O'Keefe said. "This is something we're very proud to be a part of, because it reinforces our position that all people in society have a right to realize their potential." The flag is being raised this Friday, February 7th, the day of the Olympics' opening ceremonies. Smaller flags are also being sold at local store the Travel Bug (above image) for fifty-percent off when customers assure owner Peg Norman that they will display them throughout the games. "The Olympics hold themselves up as this model of perfection, but at the same time they're quite willing, obviously, to stomp on basic human rights of the gay and lesbian community around the world, and they seriously need to look at their role," [Norman] said. "It's unfortunate for the athletes that have worked so hard to get to this level, but you also can't ignore the fact that there are basic human rights that we are talking about." According to Eddy, town councils in Gander, Corner Brook, Happy Valley-Goose Bay and Mount Pearl have also shown interest in flying rainbow flags. Eddy, overwhelmed by the support, also wanted to assure people that the protest has little to do with the Olympics themselves, but rather the spotlight placed on Russia and its anti-gay propaganda laws. His is not a message of opposition, but of solidarity. "It's not against Olympics. It's not against Russians. It's something in support of people who are going through struggles that we went through for years."